The Baby Shower Diaper Game - A Stinky Favorite! 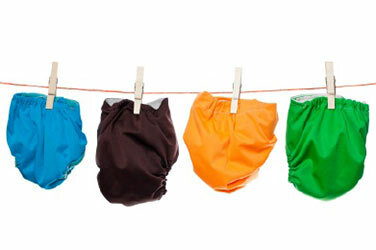 The baby shower diaper game is a well-loved favorite deserving of all its stinky goodness. If you are looking for something with tons of personality and potential, you should look no further! These popular games are sure to get your guests smiling, squirming, giggling and wanting more! Eat The Poopy Diaper- For this game, you will need to get the names of the participants from the mom to be. Have her choose people who are daring enough to play this game and fun to watch! You will need 3 or 4 participants and a table set up for them. Each one will get their own plate with a packaged diaper folded up on it. Beforehand you will want to put about 2 scoops of rocky road, or another poopy looking ice cream, on each cloth diaper and pin it up with a safety pin. The participants will have their hands tied behind their backs and on the word go they must eat the ice cream in the diaper without the use of hands. This is a very comical game! You might even want to tape it for fun. The person who finishes their ice cream first wins! Candy Bar Guessing Game- How well do you know your candy bars? For this game, you melt candy bars in disposable diapers in the microwave. Pass around papers to your guests so they can guess what candy bar is in each diaper. THe person with the most correct wins a prize. Make this game a little harder by using something other than candy bars. You can use different liquids that they have to guess. Some examples could be vinegar, pickle juice, juice, snow cone syrup or kool aid and dish soap. Baby Races- Select a few guests to diaper a baby doll blindfolded. The person who can get the diaper on correctly in the shortest amount of time wins. This baby shower game is hilarious to watch! You might want a camcorder for this one! Here is a video of a race used with guys. They blindfolded them, had them drink a bottle, change a baby diaper and eat baby food to win. Too funny! Pass the Poopy Diaper- Take a diaper and add peanut butter or chocolate to make a poopy mess inside. Instruct the guests to sit in a circle. Hand the diaper to someone in the circle. Once the music starts, they will pass it around the circle. When the music stops, the person holding the diaper is out. Continue playing until you have one person left. They get a prize. Variation- You can have the person that is holding the diaper when the music stops accomplish a task. You could also do this game to get volunteers for another game. Pin the Diaper on the Baby- Using a large poster board and a magic marker, draw a large picture of a baby. Have a diaper pre-cut out of paper for the guests to use. Blindfold your guests and have them try to stick the diaper on the baby's bottom. The person closest to the intended target wins. Twist it up!- Time your guests to diaper a partner. Split the guests into teams of 2. Time them to see who can diaper their partner the quickest. Watch a video of the game! Diaper Architects- Bring out a couple of packages of diapers. Split the group into teams. In this baby shower game, they must design a way for the diapers to be stacked as high as possible before falling. The team that is able to stack the diapers the highest wins. Poop Connoisseur- Fill baby diapers with things like rock candy, candy bars, ice cream, cake, etc. Have guests determine what each "poop" is. Poopy Prize- Fold papers into miniature diapers and connect them to safety pins. Put peanut butter or chocolate in one diaper to create a dirty diaper effect. Give one to each guest as they arrive and instruct them to wear them. During the shower have guests open their diapers, and the guest who has the poopy diaper wins.